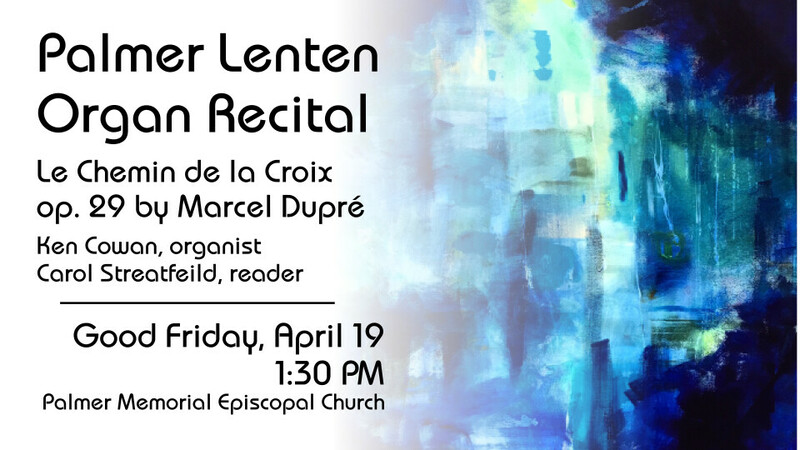 On Good Friday, April 19 at 1:30 PM Palmer's Organist Ken Cowan will play Marcel Dupré's Le chemin de la Croix (stations of the cross) on our Fisk organ. He will be accompanied by the poems of Paul Claudel read in English and French by Carol Streatfeild and The Rev'd David Wantland. This is an intensely spiritual work and a beautiful lead up to Easter. Admission is free. Ken Cowan is an Associate Professor and head of the organ program at the Shepherd School of Music, will present Dupré's masterpiece for organ Le Chemin de la Croix (The Way of the Cross). Each movement will be preceded by a reading from Paul Claudel's poetry in the original French or English translation. Both music and poems were based on The Stations of the Cross and recount Jesus journey from condemnation to death and burial. They were first performed together i n 1931 at the Royal Conservatory of Music in Brussels. Dupré was asked to improvise between the reading of the 14 Claudel poems, written in 1911. Responding to encouragement from the audience, Dupré recalled and wrote down the music during the following year. The 1927 translation chosen for this event is by the Rev. John J. Burke, and was praised by Claudel who found it "remarkable in its sobriety and terseness". The narrators will be The Rev'd David Wantland and Palmer parishioner and choir member Carol Streatfeild.